With Hertha BSC, the first major German football club has set dynamic prices throughout the whole Olympic Stadium in Berlin. We have supported Hertha BSC through the whole process of implementing demand-based pricing at Hertha BSC to transparent fan communication. Following, after the initial successful tests, the club now believes that data-driven ticketing decisions are an essential part of a modern club. After all, today Hertha’s ticketing managers have the opportunity to individually optimize and control each game, while at the same time save their fans’ interests. 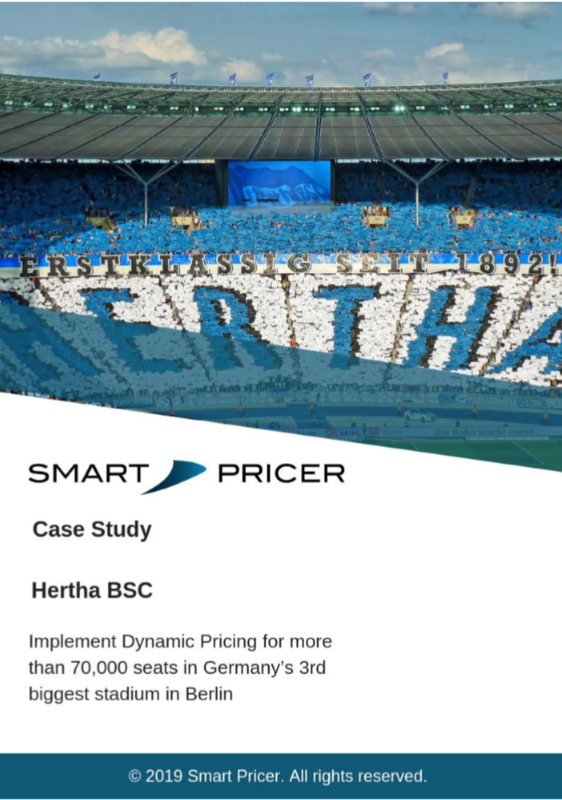 At the beginning of the collaboration, Hertha BSC, together with Smart Pricer, worked out a strategy that fits the exact needs and strategic goals in ticketing of the club. Hertha BSC sought to reward loyal fans with low prices for early bookers, while optimizing the overall available stadium seat capacity. Via a data feed Smart Pricer receives the current sales data for each game. We then use our machine learning pricing software to analyze this up-to-date data and send price recommendations for individual seat and ticket categories. Finally, those are implemented and shown through all sales channels of Hertha BSC. Secondly, incentives for buying tickets online has increased the online share significantly and allows better understanding of ticket purchase behavior and saving costs. Thirdly, the load factor in the Olympia stadium has been stable with dynamic pricing. Fans are showing neutral to good acceptance of the new system. Download the document by entering your email address in the field below. You confirm to subscribe to Smart Pricer’s newsletter for regular news and updates. Thank you for your interest in our resources. Please check your email to confirm your subscription. You will receive your download link after confirming your subscription to our newsletter. Smart Pricer will never share your data with third parties. No spam, unsubscribe anytime.